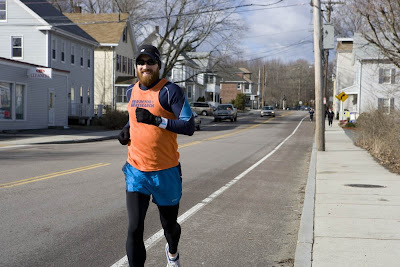 Here's a shot of me on my 21 miler this past Saturday. My beard is getting unruly - can't wait to shave it off after the marathon. Anyway, I had no idea where I was and was starting to feel tired around mile 9. Immediately after this shot I rushed for an emergency bathroom stop. Thank god for gas stations, that's all I have to say.